A cluster or complex of 84 temples, collectively known as Chaurasi temple. According to legends, Sahil verma who was a ruler of Maru dynasty had no child. Once 84 saints visited his palace. Sahil verma was polite and caring with the saints. So the saints blessed him. The blessings of the saints made him a father of 10 sons and 1 daughter. Sahil verma built 84 small temples in honour of the 84 saints. Chaurasi was the level area on which these eighty four temples were standing and the name was attributed to the 84 Sidhas who are believed to have meditated in Bharmour over 100 years who supposed to come from Kurukshetra while visiting to Manimahesh Kailash. 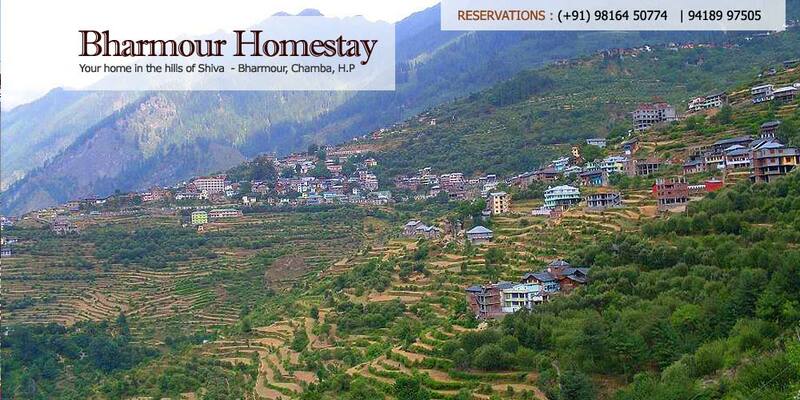 The Chaurasi Temple Complex offers you a delightful, clean and a scenic view. The complex is surrounded by numerous schools. The most extraordinary site of the complex is the tallest temple of Manimahesh, which is built in the Shikhara style of architecture. Another temple built in the same style is that of Lord Vishnu cast in his Nar Singh Avtar. Bharmour, once known as Brahmpura, was between the 6th and 10th centuries, the capital of the princely state of Chamba. It is renowned for its cluster of temples collectively known as the ‘Chaurasi’. Though of varying architectural design, these temples are noted for their fine workmanship. Kartik Swami temple, locally called as Kelang temple, is located 6 km from Kugti village at an altitude of 3100m above sea level. Temple complex have two temples one of Kartik and other of Marali. The devotees want to visit this sacred place before attempting Jotnu Pass for Kailash Parikrama and Kugti Pass. The temple and the goddess are both very important in the Bharmour region. Shepherds crossing Kali Chho pass to Lahaul (Kali is for Goddess Kali and Chho is waterfall, the pass has a waterfall close to it) visit the temple to seek the goddesses blessings for a safe crossing and have done so for ages now. Pilgrims from all over the Bharmour region and other parts of Himachal find their way to the temple to pay obeisance to the goddess. It is believed Goddess Kali grants all wishes to anyone making the journey with total devotion and fervour. It is a famous historical temple of Shiv Shakti mataji which is constructed by King Meru Varman in 7th Century. it is generally located 6 km apart from luna village situated above the ravi. The shiv shakti temple is the famous temple in all over the india in which many of visitos are come here when there wishes comes true. the most common advantage of this temple is that after the complection of the manimahesh yatra people come here from various region to see the particular location and also pray from shiv shakti mata that their wishes comes true. Kugti is last point of habitats of Bharmour tribe consisting of two village upper Kugti and Lower Kugti having very rare facilities. Kugti is 26 km from Bharmour with 20 km road head. Having a dispensary, one forest rest house and high school. Few tea huts are also available at Dhanaul and Kugti village Kugti wild life sanctuary is located at an altitude of 2250 meter and lies between Latitudinal range 32°22´ to 32°35´ N; Longitudinal range 76°44´ to 76°53´E; in Bharmour of Chamba District of Himachal Pradesh. This sanctuary has an area of 37,886.68 hectare (378.87 sq. km). It has also Pir Panjal Himalayan range. The topography of the area is mountainous having altitudinal range of 2000 meter to 5000 meters from sea level.The annual rainfall in the Kugti wildlife sanctuary is recorded 1400mm.As a whole, the climate is temperate with well-marked seasons.